After she had experienced a bout of homelessness, Satrice T. attended a for-profit college in Newark, NJ in 2008, studying to be a medical assistant. She felt very engaged in school, enjoyed learning about the medical world, and did well in her seven months of classes. The school at the time offered $350 in stipends every two weeks, plus transportation to the school. But Satrice couldn't find an internship, a requirement for finishing her course of study. Before she had signed her contract with the college, she said, the school had guaranteed her that she would find an internship and promised to assist her in doing so, but provided her no help at all. "They were just worried about getting youth in the building," she said. After awhile, she was unable to keep up with her rent, and faced eviction. "As an ex-homeless youth, it was a major thing for me," she said, "getting to work, getting money, as I wouldn't end up in the same situation, in the street, not able to pay for books." When she called the school one last time to try to finish the program, they told her she had been terminated, and there was nothing they could do for her. "It was a real hard time for me," she said. "I couldn't find employment, and definitely couldn't find employment in that field." Satrice's remaining debt, she said, played a major part in her becoming homeless again. Her $9,800 loan required a $300 a month payment, or $120 with a hardship exception. The school threatened to garnish her paychecks while she was living at the Covenant House shelter. Eventually, the college sent her account to a collections agency. For-profit colleges and schools like Satrice's account for almost half of all defaults on federal loans, receive about a quarter of those loans, but educate only about a tenth of all college students, according to consumer advocates. 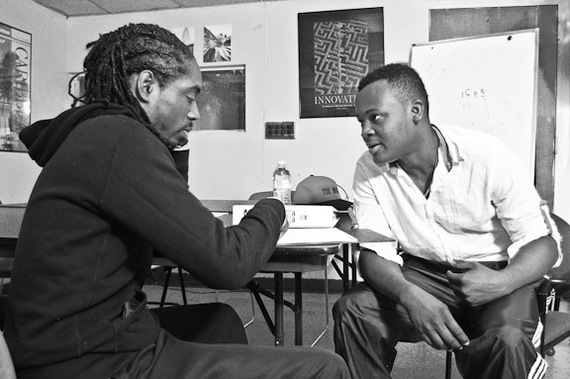 Such schools often appeal to homeless young people by recruiting at shelters and presenting themselves as a quick solution -- some don't require a long application process, some require no admission tests or very basic 12-minute ones, and some promise to provide students with a high school equivalency diploma as well as college credit. But the quality of education the schools provide can be questionable. Senator Tom Harkin, an advocate for reform of the for-profit school system, noted that one school spent, per student, $2,700 for recruiting and marketing, and only $892 on education. Andre' J. Ford, the education manager at our New York shelter, said that of the 80 to 100 young people he works with each year, 12 or 15 have had bad experiences with for-profit schools, usually the larger ones. Some for-profit schools often promise students the chance to get their high school equivalence diplomas while they take college classes, he said. The schools don't make it clear to the students that they will accumulate more debt than necessary that way, and that they may not be ready for college. Sometimes Covenant House will contribute a small amount toward helping the student get their loan out off default and onto a payment schedule, so the student can still receive financial aid from the government. David Halperin, a lawyer who writes for the Republic Report and works with a coalition of civil rights and consumer groups on this issue, criticizes the schools' tactics in searching out at-risk students. "They go recruit in homeless shelters, they recruit runaways, and foster children. They're looking for people who have low self esteem, who feel vulnerable," he said, "who are struggling to earn a living." As publicly-traded corporations, they are obligated to find new students, but may not care whether their students are qualified. "There are a whole bunch of people who are destined for failure" in the programs they signed up for, he said. As a result of their aggressive recruiting and their low investment in actual education, for-profit schools saw more than half of the students enrolled in 2008 leave within a median of four months, without a degree or certification, just troublesome debt. Although two-thirds of the students at such schools qualify for Pell Grants because of their low income, many end up getting expensive private loans to cover the rest of their tuition. These, unlike government loans, accrue interest and require payments while a student is still in school. Students at for-profit schools can pay 18 percent interest while still in school, and can end up owing up to $150,000, Mr. Halperin said. Public colleges can cost a third of what for-profit schools cost. "The price is too high, and the quality is too low, so even if you get the job you were seeking, that they promised you'd be training for, you're an apprentice chef making $30,000, but you owe $130,000," he said. When they have trouble repaying their private loans, students see their credit scores plummet, making it nearly impossible to get a federal student loan for a better school, or a mortgage or car loan. In one study of 500 for-profit programs, less than a fifth of the students were able to repay even a portion of their debt, with some loan payments accounting for 70 percent of their discretionary income. Argh! It makes me want to pull out my (non-existent) hair, that so much federal money could be wasted, while we see significant cuts in government funding for homeless young people, some of whom are being victimized by such schools while fighting uphill for a decent job and independent living. Where's the outrage? Where are those advocates for belt-tightening, who are squeezing the hard-working kids we see, rather than the schools that exploit them? The Obama administration is trying for a second time to create tighter rules for such schools, but the schools have deep pockets, and can hire big-name lobbyists and spokespeople. The first time around, the for-profit industry took the administration to court, fighting proposed rules, and the battle promises to be a tough one. I am heartened by many state and federal investigations into for profit schools, and am encouraged by one federal lawsuit charging a parent company of two dozen for-profit colleges with defrauding the government. If the plaintiffs are successful, they could win triple damages, enough to put the schools out of business. But shouldn't there be a faster solution than the courts? New York City seems to get it. Its "Know Before You Enroll" campaign includes subway ads of former students of for-profit schools who were lured in by subway ads, and a free review of enrollment contracts and loan applications by volunteer experts. "Even after the [Education] Department made multiple changes requested by the for-profit college industry representatives that dramatically weakened the draft regulation, the for-profit college industry representatives objected to it. The changes would have made the regulation so weak on predatory colleges and so hard on low-cost, high-performing colleges that not a single negotiator voiced support for the Department's last proposal. ...For example, federal funding should not be available for dental assisting and other medical programs whose graduates are ineligible for the licensing exam required to work in that field. ...The debt-to-earnings standards in the Department's last proposal were so weak that literally thousands of programs with median and mean debt levels that exceed their graduates' entire discretionary incomes would not fail the standards." Mr. Halperin's group advocates for regulations that require schools to ensure that a certain percentage of students graduate, find gainful employment, and do not fall in to overwhelming debt. You can sign a petition to the U.S. Department of Education asking for stricter regulations here. "There ought to be a lot more public education by the government, and law enforcement actions, to make the schools themselves make stronger and clearer disclosures about their graduation rates, which they lie about, and their placement rates," he said. Reforms should cut off exploitative programs and give companies incentives to help students, he said. "They get about 86 percent of their revenue from federal financial aid money, and they're not entitled to that money in perpetuity unless they're helping students," he said. Jahad R., 20, spent years in foster care, and first came to Covenant House at 16, after a relative kicked him out. He attended a for-profit college, studying business management, for a year. "It was Grade A trash," he said. "They teach you what you already know." He said the school was good at manipulating him and lying to him, telling him he was eligible for both New York State's Tuition Assistance Program and the Free Application for Federal Student Aid, which he knew would be highly unusual. "I was so happy, but they were lying," he said, adding that he didn't receive the state aid. He attended classes but did not graduate, and estimates he owed between $4,000 and $5,000 before his account was sent to a collection agency. Covenant House helped him fix his credit by paying down some of what he owed. As he spoke, a commercial for the school came on the television. Jahad, who is no longer homeless, said he has three friends who lost their apartments while attending the school. "They couldn't pay their rent, and they had to stop going to school," he said. Andre Ford, the educator at Covenant House, said counselors are urged to send young people to the shelter's education department to get help in planning their post-secondary education, and to learn of the risks of for-profit schools. He wants to protect their native resilience from the disappointments of exploitative schools. Now 24, Satrice is aiming for a public college, after making payments to get her loan out of default. Recently, she looked back at her notebooks from when she took a Life Skills course. "In one of my short term goals was employment, a high school diploma, getting a drivers license, and having my own apartment," she said. "I've accomplished all of that...I won't give up. I won't get discouraged. I'll think positive, and I will get my degree."